100% Made in Italy. Velvet flock. Inside synthetic leather, Insole leather. Note: Sorry, only black and blue is currently in stock! 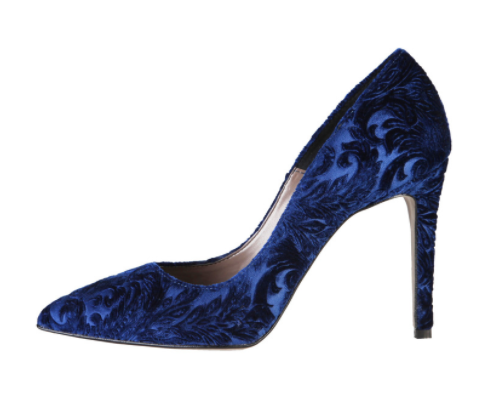 This Chiara Velvel High Heel Pump By Made in Italia has a detailed velvet upper which is trending on top. This high heel has colored nuances that brighten and change with the reflections of light giving an aristocratic tone to your outfit. This velvet high heel is 100% Made in Italy with insole leather. Heel height on the chiara velvet high heel pump is 3.93 inches, comfortable, yet high enough! Pair this heel with a sleek black dress, peddle pusher black suit, or jumpsuit and you’ll turn heads and take not prisoners! Velvet is the new black! Oh, and it comes in black too! Start stepping!